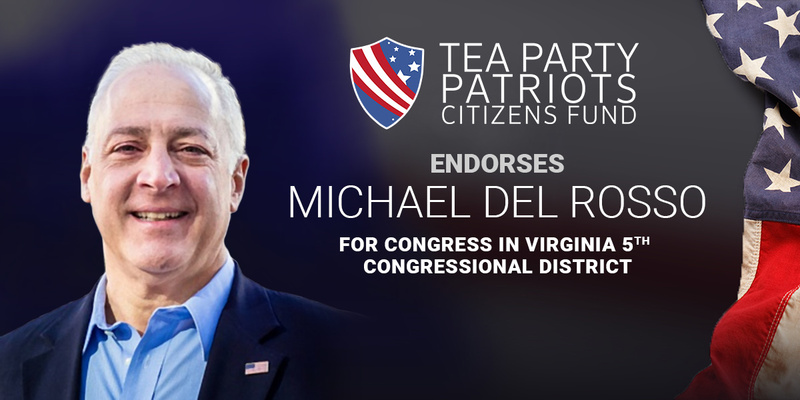 “For conservative members of Virginia’s 5th Congressional District Republican Committee meeting today to nominate a candidate for Congress, the choice is clear – Michael Del Rosso. “Tea Party Patriots Citizens Fund endorsed Michael for the open seat two years ago. We have continued to follow his work, and we believe he is hands-down the best candidate to hold this seat in what promises to be a bellwether race against Democrat nominee Leslie Cockburn – a contest that Nancy Pelosi and the national Democratic Party will try to turn into a referendum against President Trump. “Michael Del Rosso is a true national security expert, a leader who understands as few do the true nature and depth of the threat facing America in the 21st century. As important, he has a deep understanding of and love for the constitutional principles of limited government and individual liberty that have set America apart for more than two centuries, and a determination to fight to protect and expand personal and economic freedom, and return us to a debt-free future. “Since then, the only thing that has changed is that the stakes have become higher.